It starts now! (IRL, as I write this.) Mainly because I’m just too excited to do nothing. I get my skin ready for anything // We all know traveling is hard on your skin. Dry airplane air, germy public transportation, lack of sleep, and an overall different environment than you’re used to definitely makes your skin go haywire. In the two weeks prior to my trip, I load up on masks, toner, exfoliator, and moisturizer to make sure my skin embarks at it absolute healthiest. I use Queen Helene Mint Julep Masque about every other day so I’m sure my pores are extra deep cleaned. I’m not much of a toner person when I’m not traveling, but special times call for special measures. T.N. Dickinson’s Witch Hazel has been my go-to for years. It balances my skin pre-travel, and is also great for soothing minor irritations while we’re on the go. During this time, I tend to snuggle up extra close with my favorite moisturizer, Clinique Dramatically Different Moisturizing Lotion+. Whereas some nights I can’t be bothered to apply lotion and lovingly massage it in, I never skip this step when I know the most stressful time of the year for my skin looms near. Exfoliating is also very important. My skin is accustomed to a tropical environment, and it gets quite grumpy when removed from the humidity. I don’t have a favorite exfoliator, I just use what I available. Things are getting serious, now! Gathering items // I start thinking seriously about what travel makeup and skincare products I’ll be taking with me about one week prior to departure. I designate a spot where I place these items and visit them throughout the week, adding and subtracting to curate the perfect collection that will serve me best during my travels. Listening to see what my skin wants // Our skin isn’t just some inanimate object, it’s a living part of us with a personality of its own. Sometimes it may crave moisture, while other times it may let you know it’s feeling congested. I take care to pay attention to the signs now so that I don’t run into nasty issues later. Shopping for bits & bobs // Once I have a solid plan in mind, I go shopping for everything I will need and I buy everything in one trip. It’s much easier to forget something when your shopping is spread out over multiple trips to the store. In addition to beauty products, this is also when I pick up necessities I absolutely cannot forget, such as Dramamine and a travel sized bottle of contact solution. 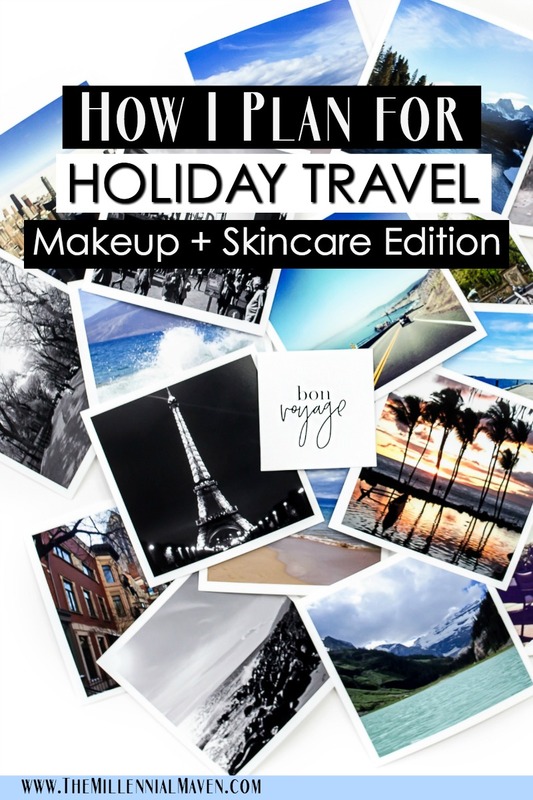 Getting inspired & picking out travel makeup items // I don’t completely change up my look for travel, but I enjoy gathering inspiration for easy looks I can create with my limited travel makeup while on the go. Get ready for those pictures! I bottle my skincare & toiletries // My partner and I travel with carry-ons only, so consolidating liquids is priority number one! 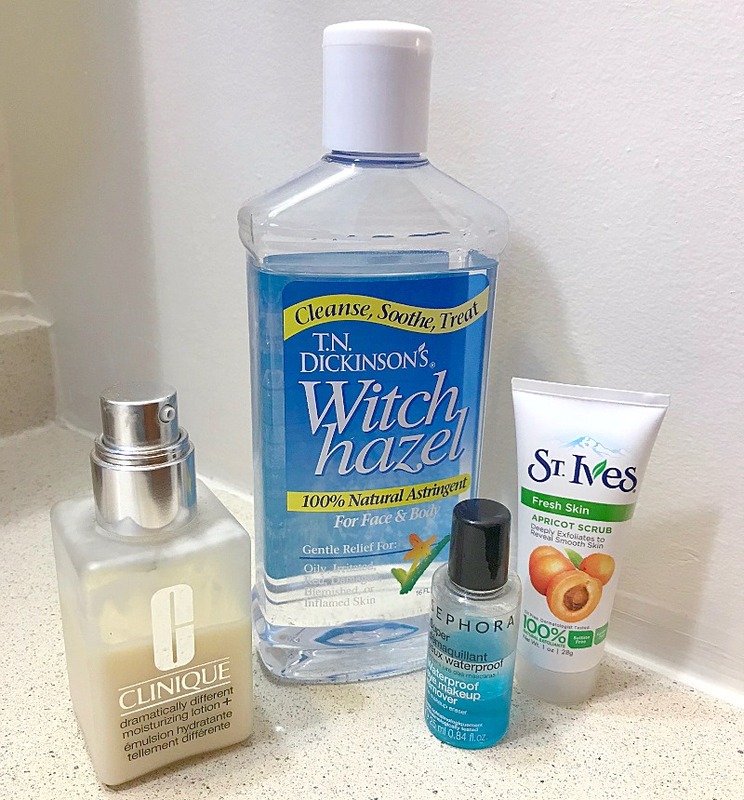 Not all of my favorite products come in convenient travel sizes, and I don’t think you should have to go without when bottling your own is so easy. I use Humangear GoToob refillable bottles in the 2 oz size. I find that’s enough of each product to last me about a week without going overboard. For more detailed run-downs on how exactly how I pack, check out these posts! 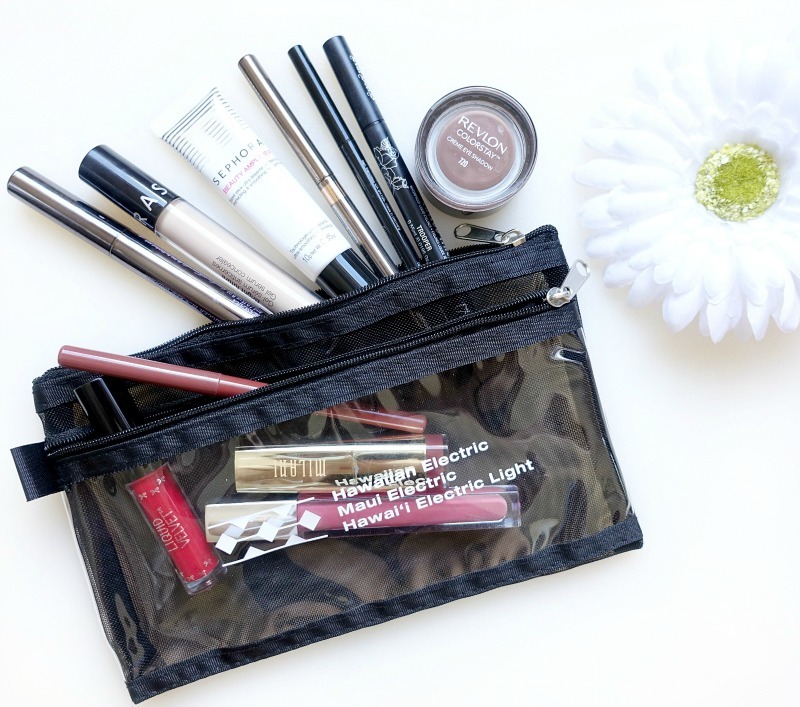 How To Pack Your Travel Makeup Bag (Best Tips + Hacks!) and Minimalist Makeup: How to Create *3 Gorgeous Makeup Looks with only 8 Products! I go through my beauty rituals // All the things that I do on a regular basis, but want to minimize once my trip starts. Tasks like tweezing my eyebrows, (and upper lip, let’s be real,) freshening my mani & pedi, and using a hair mask. This way, I’m looking good and feeling fresh when I embark on my grand adventure. I recently noticed a huge void in my travel makeup and skincare routine. I can go on and on about how I prepare before departure, and what my skincare routine looks like once I arrive, but not a peep about what happens in between. Applying my “landing lips” // Tell me you have heard this term too, and it’s not just me watching too many flight attendant vlogs? Long flights have a way of making us look and feel especially haggard. I designate the last 45 minutes of long flights, (which is basically any flight out of Hawaii unless I’m headed to Hilo,) as “freshening time.” I head to the lavatory and brush my teeth, wash my hands, and tidy my hair. Doing a full face of makeup at your seat is impractical, (unless you fly first class, which I am not.) I have a condensed version of my travel makeup routine that I do so I look presentable upon landing. It’s not much, but it’s the little details that make all the difference. Look out for a post all about my airplane makeup routine coming up later this week! Things go wrong during travel; it’s just part of the adventure. But what’s less fun is when your skin starts freaking out and you end up looking splotchy in all your vacation photos. When I travel, I make sure I plan for any situation. These are things I think about. Undesirable hygiene accommodations // As a self-professed clean freak, I imagine (in horror) every dirty situation that could go wrong. I always keep makeup remover wipes, antibacterial hand wipes, and hand sanitizer handy. Also, have a stash of hair ties available, even if you don’t think you’ll need that many. You never know when the one you’re currently using will fly out of you hand and land on the airport bathroom floor. Do you really want to put that back in your hair? Didn’t think so. Unfettering delays // Sometimes (read: often) flights end up being delayed. Which means sitting in the airport for longer then anticipated. I can’t tell you how many times I’ve thanked myself for packing a few “just in case” extras. That extra pair of contacts, dry shampoo, and a little bottle of mouthwash go a long way when you’re stuck.